Let me start off by saying that I am no expert! I am just like millions of other moms out there, but I did create this platform to help other women. I’m excited to dive into this topic and shed some light on my personal experiences and connect with other moms that may have experienced some of these things! You may resonate with some of my stories, or maybe you didn’t experience what I did at all! EVERY SINGLE PREGNANCY IS DIFFERENT. Trust me, I was the google queen my entire pregnancy and one person’s symptoms are not necessarily yours. Everyone wants to share their experiences and stories and if I’m being completely honest, people with good intentions completely freaked me out by sharing sometimes. This is not what this blog is about! This is just to give some insight and share some things that I would’ve wanted to know before I got pregnant so it wasn’t a surprise! I wasn’t prepared or ready for this. When I first found out I was pregnant, first I didn’t even think it was REALLY HAPPENING. Then once it sunk in I was terrified. Not about becoming a mom or bringing a child into the world. I was literally terrified that something was going to happen to the baby. We told our parents and close family members at 4-5 weeks, and some friends that we could trust because we were SO excited, but also because my anxiety was sky high. We chose to tell our family because if something DID happen, we would be devastated and would need their support. Once we shared the news, my anxiety lessened but I still had days where my anxiety was really high. I could write another blog post on how I tried to manage it, but I really focused on saying positive affirmations, journaling my feelings, tracking my emotions, and reaching out to friends who already had babies. It’s so important to not hide it or be ashamed of it. I think most of my anxiety came from hearing my friend’s stories about their miscarriages and knowing how common it really is. That doesn’t make it any easier or better to deal with. Just know that anxiety at the beginning, especially up until the 12 week mark is NORMAL and it will be okay. Don’t hesitate to reach out to others or talk to your doctor if your anxiety worsens or feels unmanageable! There is no right or wrong time to tell people when you’re pregnant! When you’re pregnant, a lot of people have opinions on things and you have to do what feels right. Some people choose to wait until the 2nd trimester, and others share when the test has dried! YOU and YOUR PARTNER need to choose what feels right. There is no reason to be ashamed if you’re so excited to share the news. There is also no reason to feel bad for waiting to tell your friends and family. EVERYONE IS DIFFERENT and that’s okay. Again, this was something new to me personally when I became pregnant. The first trimester I was honestly too tired to function and I had no energy to go out with friends and do my normal things. I found out memorial day weekend of 2018 so it was even harder that it was Summertime and I felt like I was “supposed” to be doing all the things, when all I really wanted to do was sleep. Can I get an amen? Once the fatigue wore off, I realized what a weird (but totally exciting!) time pregnancy is. I couldn’t do my normal happy hour dates with friends and I really didn’t have any other friends pregnant at the same time. Pregnancy is filled with so many emotions and there is so much going on in your body (and mind!) that I felt a little disconnected at times from friends. It wasn’t anything they did; I Just feel like pregnancy made me a little hermit crab this Summer which was another thing I wasn’t expecting! It’s like this strange time when you’re not yet a mom with a baby, but you also are stepping into a new stage of life and have different needs than you did before! It really helped to have friends that would text and reach out to check on me and see how I was feeling, and rely on my husband to talk through everything with. Of course family was there for me 100% and at the end of the day, I had to release pressure I was putting on myself and just lay low. It’s a season of life and it’ll pass! But, it could be isolating at times, especially in the Summer when I wasn’t working and stayed home more often. It sounds cliche but it’s true. Ross and I were so nervous about our 8 week appointment (again, first-time parent anxiety!) but we were so excited to see the baby. 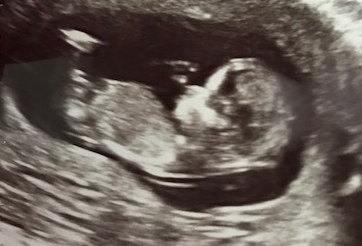 It was a completely surreal moment to get my first ultrasound and see that little bean on the screen and hear it’s heart beat. I will never forget looking over at Ross’ face and seeing it light up when he saw the baby. What a relief, and so much love. It gets better and better with every single appointment, and I can only imagine the love I will feel when we meet our sweet baby for the first time! 5. Your mind will be going 100 MPH, all the time. Throughout the different stages of your pregnancy, your mind will be going all the time. 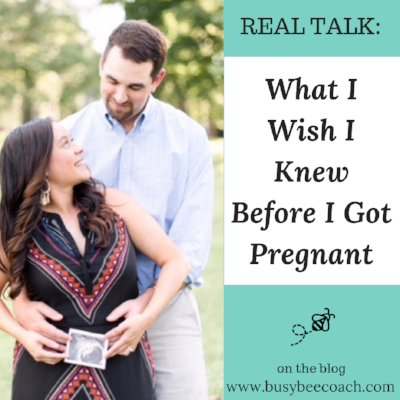 At first, it was concern about the baby and the anxiety I had surrounding the first trimester. Then, it was excitement about sharing our news on social media and getting to the 2nd trimester. Then, it was our baby registry and shower details. Then, it’ll be decorating the nursery, washing the clothes, finding daycare/sitter, etc. The list goes on. I can’t even imagine how my mind will be right before I deliver! Again, this is totally normal. I was kind of like this when I planned my wedding! It’s all you can think about because it’s such a huge and exciting time! Overthinking and talking about the baby non-stop is totally normal! I felt like I put a lot of pressure on myself at times throughout my pregnancy. My anxiety threw me for a loop, the fatigue made me feel guilty that I was sleeping all day and I also felt bad that I just wasn’t feeling myself energetically! As a mom-to-be, you’re going to need support from your husband and your family as you grow a human inside of you! You’re not going to be yourself and that is OKAY. Maybe you won’t be up to cooking dinner like you normally do. Maybe you have zero energy for the grocery store and decide to get them delivered instead. Maybe you say no to going out to dinner with a group of friends because you’re just not feeling up to it. Maybe you’re moving or changing rooms in your house to prepare for the baby and you get frustrated because you can’t help out as much as you want to. Maybe not fitting into your old clothes or looking in the mirror and seeing changes in your body makes you feel insecure. Maybe you get overly emotional about something and have a melt down with your husband. Been there, done that. Guess what? It’s okay. 7. Lastly, it’s the happiest and most exciting time of your life! From watching your belly grow, to feeling your baby’s kicks for the first time, pregnancy is such an exciting time! I have enjoyed every minute of announcing our pregnancy, planning our gender reveal, counting the days to our doctor’s appointments and getting little gifts in the mail from friends and family. It’s just so special! Get ready to be in the center of attention, and own it! People love pregnant people! It’s crazy how much I love my son already, and I can’t wait to meet him in just a few months. I’m going to end this post here, at 22 weeks pregnant! There may be a part 2 to this blog post because I still have a way to go! For now, these are the ones that have stuck out to me the most and I can’t wait to hear from YOU about some of your experiences, and if you could relate to any of these. Tag a mom-to-be that might resonate with this article, or share online, because lets face it, it just feels better when you know you’re not alone! Click here to learn more about my business as a life coach, and see how talking to someone outside of your circle can transform your life or business! Want to know more about me and my journey before getting pregnant? Click here! SHARE USING THE BUTTON BELOW!